Comments: This picture has alot more red in it than most of my other pictures. This is one of the reasons why I like doing commisions for other peoples' characters. Their ideas for the design are often times much different from mine and help me broaden my horizons with my art ^_~. I really like how his cloak came out. There is a little something I see that is odd about his arm closest to the right of the page.... But other than that I think it came out well. One of the characteristics the client put into the character's description was "bishi" or pretty/manga-style male ^__^. I hope I got that portrayed well enough here. 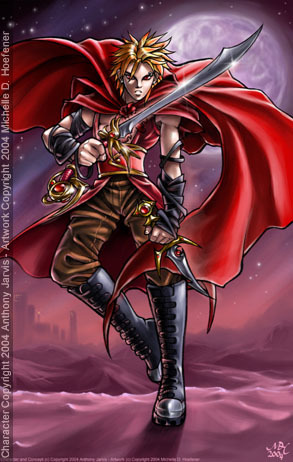 All artwork on this page is � copyright 2004 Michelle D. Hoefener, and this character, Alexander, is copyright 2004 Anthony Jarvis.